Kevin and Hanna Jones first travelled to Northern Norway in 1959. 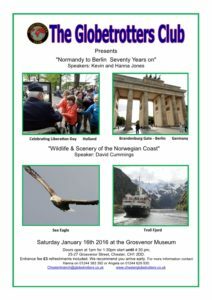 This story is about the wonderful wildlife & scenery of the Norwegian Coast. On this journey we are travelling the fjords on the SS Lofoten, the old lady of the Hurtigruten fleet, and visit 34 ports along the way. We learn about the Vikings, about medieval Norway through their Stave Churches & Nidaros Cathedral. We see the work of the farmers, fishermen and learn about their folklore. We visit the horrors of WWII, and the rebuilt towns and villages of the North, as well as visiting the North Cape, the most northerly point in Europe and the Russian border at Kirkenes. We see tens of thousands of sea birds, including magnificent white-tailed eagles, puffins, guillemots, razorbills, kittiwakes, eider and long-tailed ducks and lots of terns etc. It was the journey of a lifetime, and although we didn’t see the Northern lights on this occasion, I will share with you my experience of studying them in 1959 as sputniks flew overhead of my camp to their base in Russia. Kevin Jones with his wife Hanna have travelled extensively to visit and photograph widely, both here and abroad. As Europe celebrates 70 years of Liberty, we take a journey to revisit some of the interesting sites, places and events along the way from rural France to modern, yet very traditional Germany.